Forrás: The Jerusalem Post. Szerző: Susan Hersh Sachs. The hina ceremony is colorful, romantic and entertaining, but in the early years of the state it went underground. Ask anyone who knows anything about a hina (the Hebrew for a pre-wedding henna ceremony) any question about it – ask them if they had one before they got married; ask about the last one they saw; ask if they’ve been to a Moroccan or Yemenite or Indian hina – and what’s the first reaction you get? Watch the face: You’ll get a smile, even before they begin telling you how much they enjoyed it. The hina is a spectacle, a romantic comedy, an interactive musical with spicy dancing to a stimulating beat; it’s fabulous, colorful costumes, sometimes against a special stage set, and always good, ethnic food that’s heavy on the sweet side. It’s Purim in July (or whenever) – a warm, friendly celebration of the exotic and familial, traditional and trendy. So what’s not to like? Although hina celebrations came to Israel with the immigrants from North Africa and Asia, you don’t have to be Sephardi to attend one. Today you don’t even need to know someone who married into a Sephardi family, although it still helps. 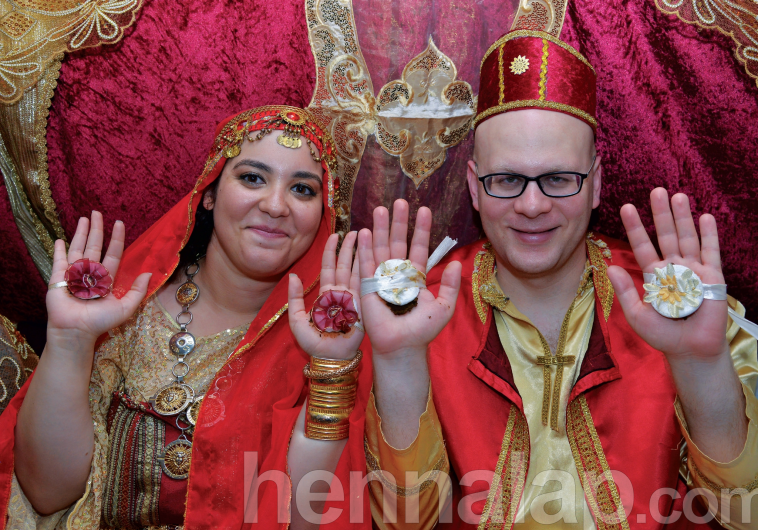 Yehudit Enoshi, who arranges celebrations in the style of old Tripoli, says she recently prepared a hina for an Ashkenazi bride-to-be marrying an Ashkenazi guy. Enoshi explains that in the pre-wedding events in the old country, two women would accompany the bride – who would be dressed in traditional garb, including a full-face veil – and lead her in a procession from house to house through the whole neighborhood while two men conducted the groom. Those were the days, she says, when pre-wedding festivities lasted a good eight nights, when the henna ceremony was often coordinated with the bride’s premarital first dip in the mikve. During the early years of the State of Israel, in contrast, hina ceremonies all but went underground, having been packed away with all other customs of immigrants’ countries of origin. They appeared, if at all, only in places where immigrants of like background were clustered – the moshavim and development towns – but hardly ever in the cities. When she married some 46 years ago, she was the rare bride of her time who did have a full traditional hina, although her husband-to-be did not take part in it. In recent decades, the ceremony has undergone a revival, with the grand evening culminating in the young couple getting the henna dye spread on their palms before a final photo op. AT THE hina that Enoshi conducted for my daughter-in-law in Hadera, I asked if the bride’s grandmother, who had arrived as a youngster from Tripoli, had had one like this before her wedding. “No hina at all,” answered the grandfather, who is originally from Poland, “because she married me, and I’m Ashkenazi!” I asked the bride’s mother, who hosted the evening, what she’d had before her marriage. Of all the happy people at this event, nobody enjoyed herself more than the grandmother from Tripoli, her Ashkenazi husband of more than 50 years notwithstanding. This hina began with the entrance of the bride and groom in corresponding white outfits trimmed in gold. Later, my daughter-in-law explained that white is not the traditional Sephardi color for weddings; it’s only the introduction. Red is traditionally used for weddings, and therefore the couple’s respective third and final costumes of the evening were red and gold. For the in-between costumes, they could choose any color, and she had picked pink. Act III, Scene 3 – The finale is the application of the henna, and the denouement is the final photo with the bridal couple’s henna-covered palms raised toward the camera. Enoshi states that she consciously strives for a dramatic peak leading up to the application of the dye. An Ashkenazi father interviewed about the Yemenite “hina” for his daughter-in-law quoted their son’s reaction. “It was very emotional,” he said. “The singing was mixed with crying, even wailing, because their daughter is leaving home.” He also said he felt emotional when all the relatives came up to bless them. IS THIS celebration taken entirely from other Middle Eastern cultures, or is there anything particularly Jewish in it? Noam Sienna, a henna artist living in Toronto, who has done extensive research on the subject, finds references to the dye of the henna plant and its uses for healing and decoration in ancient Jewish sources, beginning with the Song of Songs. He notes a specific reference to a pre-marriage henna ceremony in 13th century Egypt. Enoshi says that Jewish elements are superimposed on preexisting Arab customs. Thus, in her speech to the bride and groom just before the application of the henna, she elaborates on the symbolism of the ceremony, on the groom’s responsibilities and on the praise of a woman’s traditional roles, including the mitzvot of halla, lighting Shabbat candles and immersion in the mikve in their new life (in Hebrew, “hina” is an acronym of halla, nida – the woman’s status between menstruation and immersion – and hadlakat nerot, candle-lighting; the additional “yod” stands for the presence of God). Leora Satamker plans henna ceremonies according to traditions from India, where it is called a mehndi. This is a henna ceremony of a different color: Among the differences is that green can be a dominant color in the garments, not just red; green represents prosperity. The bride’s gown, sheer veils and long scarves are heavy with gold trim. The bride enters in a small but stately open carriage, held aloft by several men. The groom is led under a parasol – in times past, he would have been seated on a horse. These elements imply royalty: The bride and groom are princess and prince of the evening, and as in the traditions of other areas, they are seated in a decorated tent suggestive of the huppa. The bride and groom are showered with colored rice, symbolizing fertility, intermixed with gold. A platter is held over the heads of the unmarried young people in attendance, with the hope that they will be next to marry. Meanwhile, flower wreaths are placed on the heads of the bride and groom, sliding down to drape over their shoulders. The henna application itself can be just a covering for their index fingers, or a professional may coat the bride’s arms with intricate designs, which are thought to beautify her. Satamker also mentions the use of turmeric on both the bride and groom, to make them glow. The major Jewish element of the mehndi is that the entire evening is preceded by an extensive litany in honor of the Prophet Elijah, who will usher in the Messiah, in a ceremony called a “melida” after the Indian name of the sweets and new fruits that are served. My future son-in-law, who is from Mumbai, showed me where to find this song in my siddur (prayer book). It follows the “Havdala” prayer, although most of us only know the chorus – “Eliyahu hanavi, Eliyahu hatishbi, Eliyahu hagiladi” – and aren’t aware of the entire chant. Although Enoshi has described the procession through the neighborhood as passé, Chana – a middle-aged woman of Moroccan background who was born and raised in Beit Shemesh – asserts that from time to time she sees Yemenite brides in full regalia, including the high headgear and draped in multiple heavy necklaces, being accompanied by drummers and led through the streets of the older parts of town. To those who still ask, “Why?” one could answer that a hina is just for the fun of it, and isn’t that enough? Chana says the point is to rejoice with the bride and groom, which is a mitzva. And if it keeps the prospective in-laws and grandparents happy, too, all the better. One could add that modern, third-generation Israeli children can feel more comfortable celebrating their ethnicity now that they are well-integrated into Israeli life (with the exception of an occasional glass ceiling). Certainly the references in the literature to the more superstitious elements of the celebration’s earlier variations – for instance, that the henna is meant to bring good luck by chasing away the evil spirits – are not mentioned by any of my interlocutors.